The image is from LOTV "Me and My Cat", I've coloured in with promarkers ( Ice Grey 1,2,4, Khaki, Marsh, Olive, Amethyst, Orchid, Tan, Cinnamon, Chestnut, Ginger, Spice, Apricot, Oatmeal, Buttercup, Mustard, Cerise, Rose, Pale Pink, Baby Pink, Blossom). The sentiment is also from LOTV. 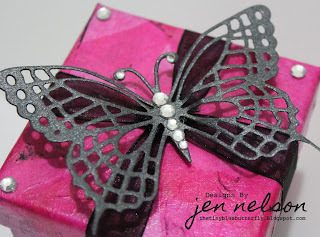 I've used a sizzix embossing folder ( one of the Tim Holtz ones) to emboss the stone effect and then rubbed in memento ink ( grey, brown and black) to get the stone effect. 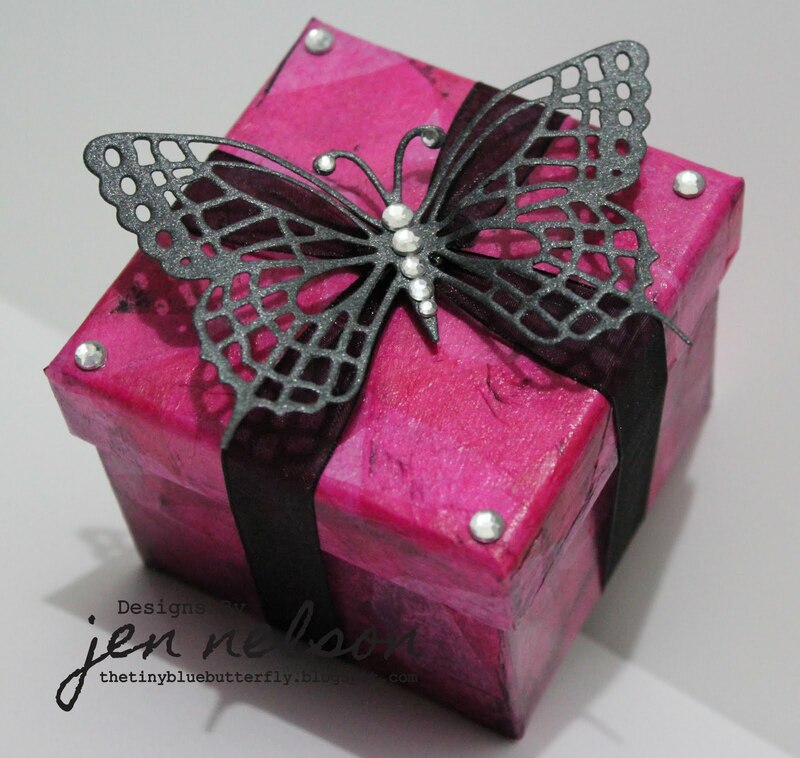 It's finished off with a couple of butterfly's and a scrap of ribbon. 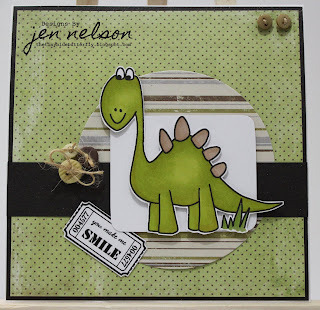 Well my lost mojo seems to have semi returned this morning (Phew) so here I am with a quick card for this weeks Passion For Promarker Challenge which is "Pre-Historic". 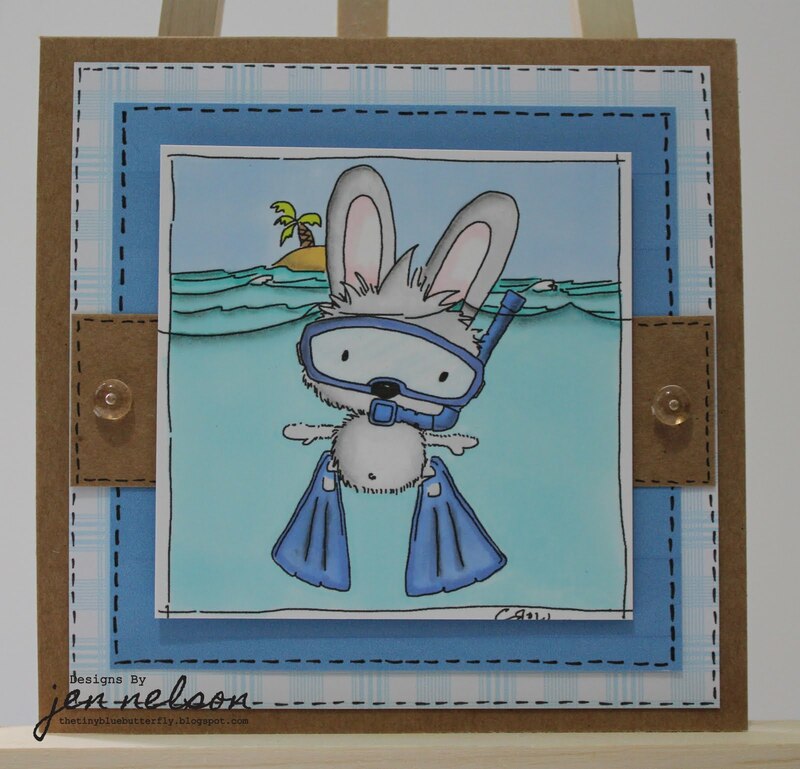 It's also Digital Tuesday and this week's challenge is a sketch by Natascha. It also fits in with this weeks Crafty Catz # 79 - Children's Cards. 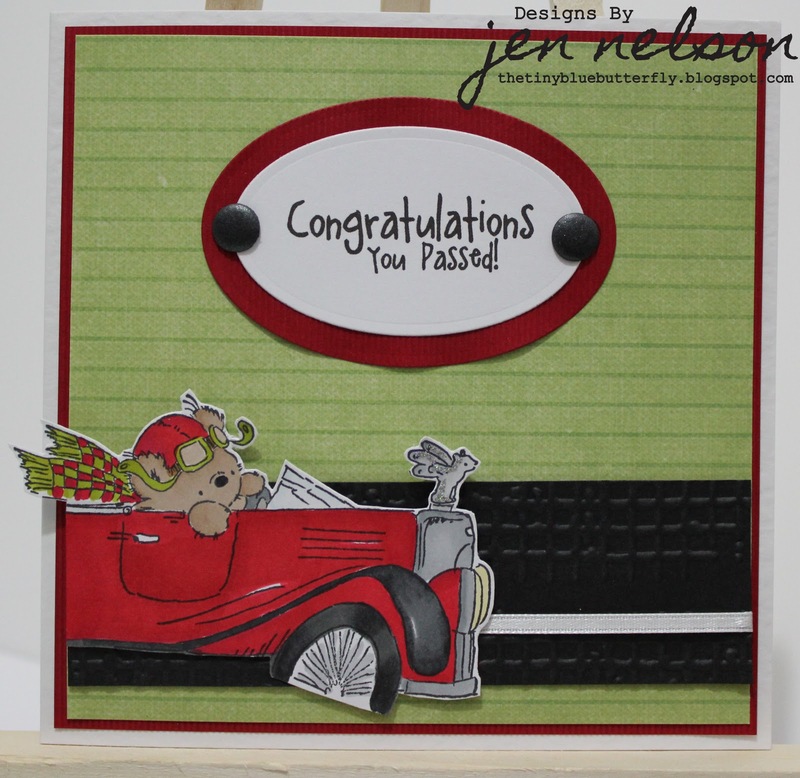 The Image is Eric from Digi Stamp Boutique and it's coloured in with my trusty promarkers ( Moss, Pear, Marsh, Tan, Cinnamon). The papers are from My Mind's Eye Wild Asparagus collection. The sentiment is from Scrap-A-Licious. Buttons are from my stash and twine from the Ribbon Girl. 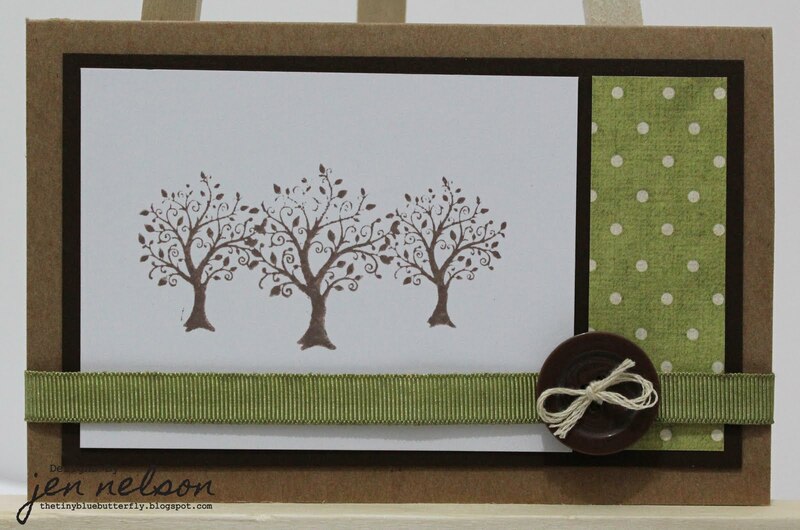 Image is from Kanban Set Autumn Silhouettes and is stamped with rich cocoa memento ink. The spotty paper is In the Meadow from Nitwit collections free with a magazine and the ribbon from a really old making memories ribbon card. The button from the extras from clothing. Paper are Pink Petticoat, white grosgrain ribbon dove craft from stash and white card candy from craft work cards coloured in with the Arctic promarker. I've used my new Martha Stewart punch for the circle border. 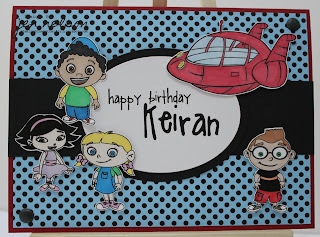 Well here is the second card for Keiran... using Little Einsteins as the theme... 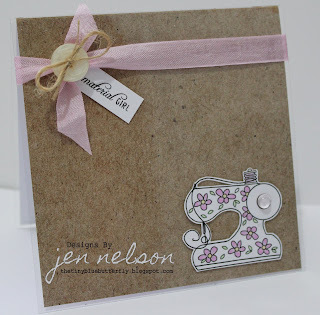 I sort of followed the sketch at "Sew Many Cards #51". Images are from colouring sheets found from google again, coloured in with promarkers ( far to many to name LOL). 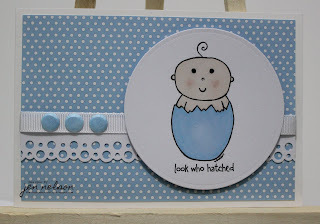 The blue spotty paper is MY OWN lol courtesy of a little work with Adobe Illustrator as i couldn't find black spots on a colour in any of my papers digi or printed lol. Sentiment is printed from PC. 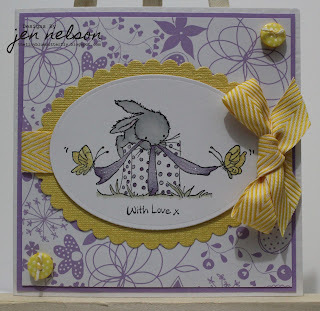 The image is a colouring page from google images ( these are so useful, especially for children's cards) and I have used my promarkers to quickly add some colour ( Tulip, Mustard, Blossom, Ruby and Berry). 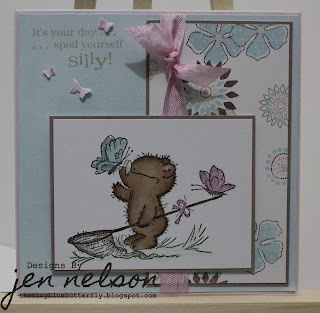 The Kraft card is from Pink Petticoat Organics set and the sentiment is printed using Walt-O-Graph font (freebie). Well Chrissie and Mandi are challenging as ever this morning with a theme this week of "Off Centre". And boy did I struggle... I'm not really happy with the end result, so you are likely to see me again at some point this week LOL. Here is the card. The papers are from My Minds Eye Tickled Pink collection, Seam binding and dew drops from the Ribbon Girl and I have used Sizzix Tim Holtz Butterflies. 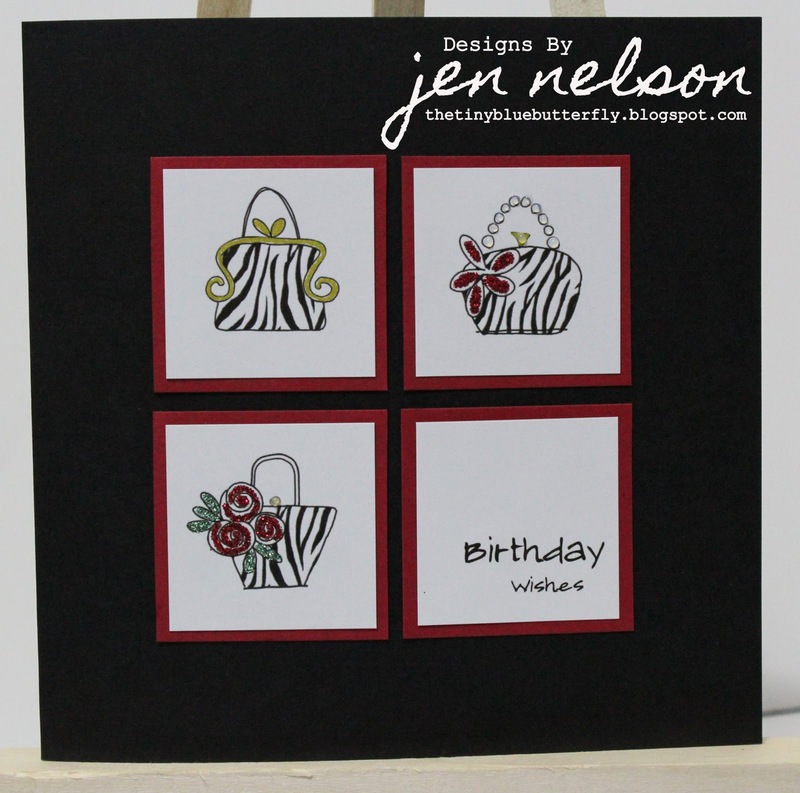 The Tim Holtz ATC card was used to cut out some of the layers. The sentiment is from a freebie at Scrap-a-licious Times, you really should check these out as they are amazing. 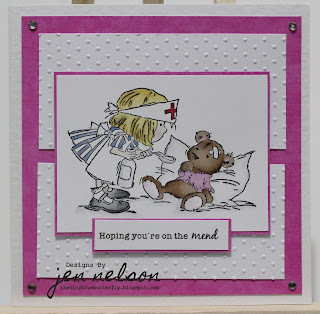 The main inspiration for today's card does come from Passion for Promarkers "White on White" challenge. 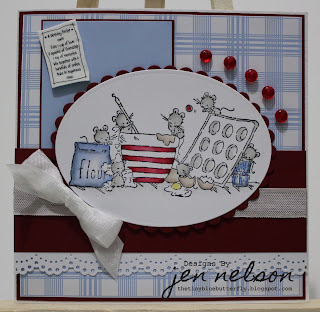 So enough waffling, here is the card.. 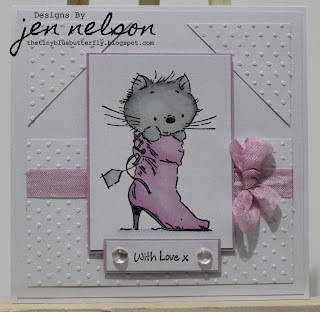 The image is LOTV's Puss In Boots (another not yet inked until today), and I've coloured it in with Promarkers ( Ice Grey 1-5, Black, Blossom, Fuchsia Pink and Pink Carnation). 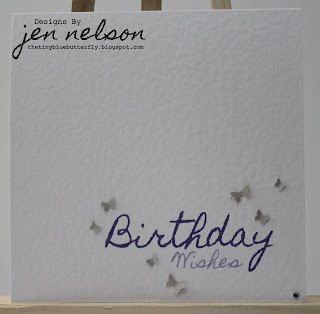 I've embossed white card with a cuttlebug embossing folder ( swiss dots). It's finished off with some pink tulip seam binding and and a couple of clear dew drops. 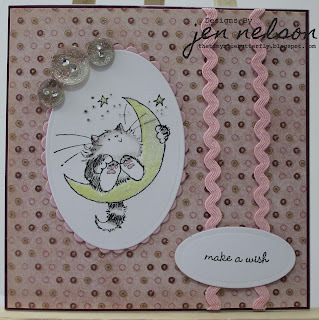 The sentiment is from a Fizzy Moon set. I'm entering this into the following challenges as well ..... 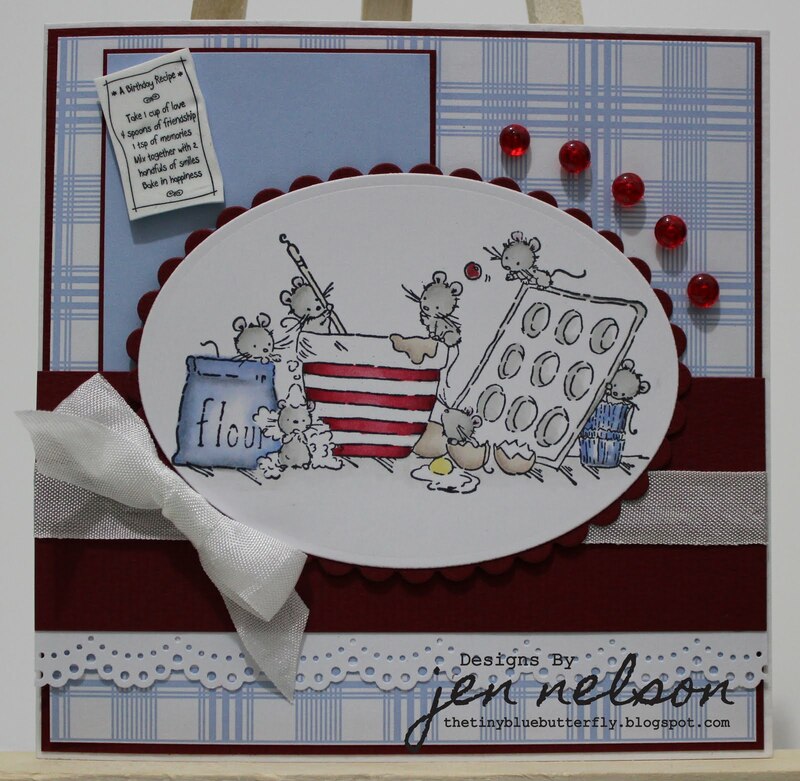 Crafty Catz Furry Friends, Fab n Funky Dots & Spots, Craft Your Passion You've Been Spotted. 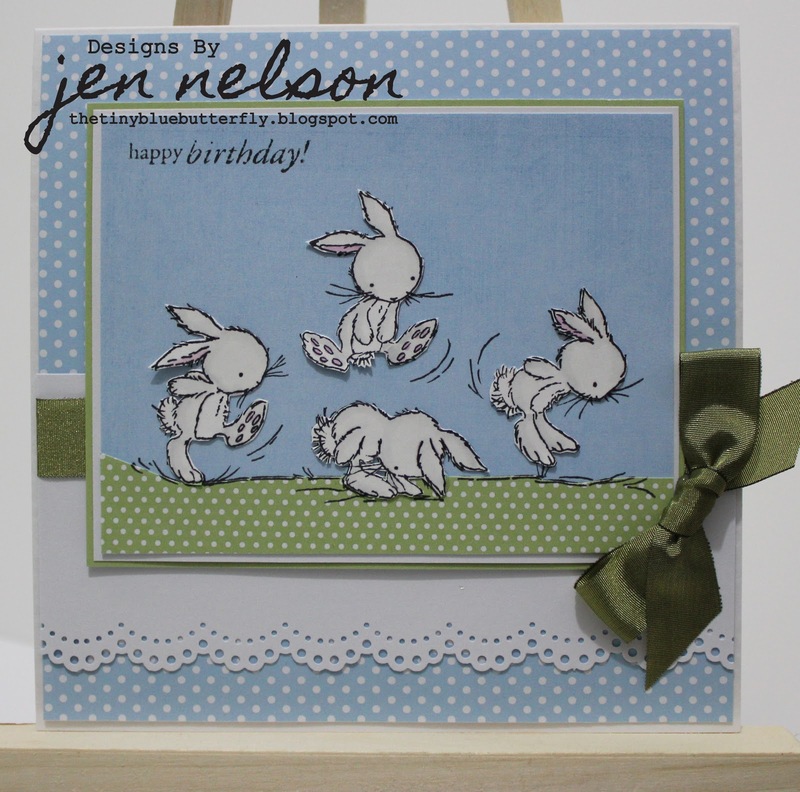 I've also used the Sketch from Sketch n Stash. 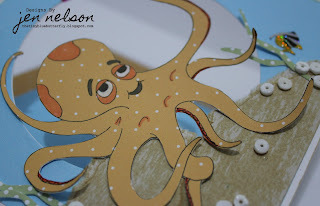 Hope you are all looking forward to the Easter break,I know I am, I'm planning on starting decorating my new craft studio (well at least stripping off the old wall paper lol). The image is from T for Transparent Penny Black, coloured simply with promarkers ( Buttercup, Tulip, Mustard, Duck Egg, Cool Aqua, Amber). 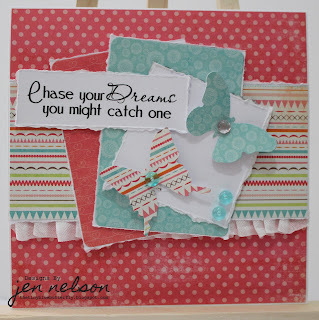 The DPs are from MME's Hattie collection and I've printed the sentiment from my PC (Fonts - Anke Print, Courier). It's finished off with a little faux stitching and yellow ribbon from the ribbon girl. Which One Shall I Open First? 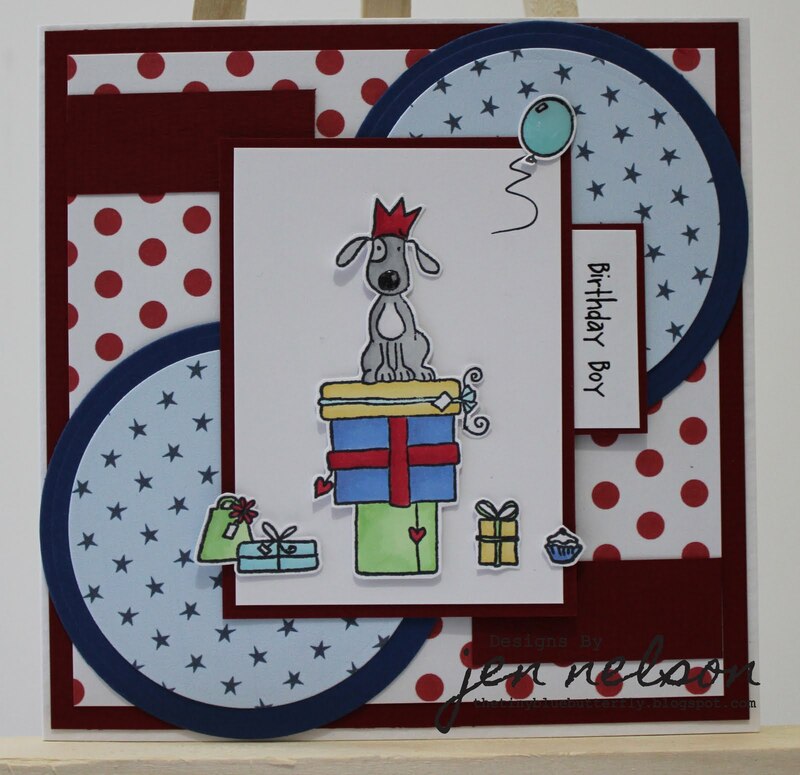 The stamp is an image called "Doggie Parcels" from Little Claire and I've coloured using my trusty promarkers (ice grey 1,2,5, buttercup, mustard, meadow, apple, cool aqua, duck egg, colbalt, china blue, cardinal red, ruby). 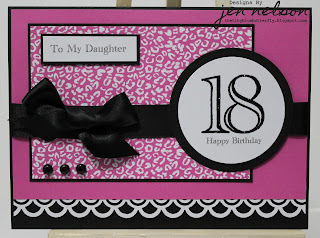 Papers are from Pink Petticoats Big Fella collections and lots of dots. 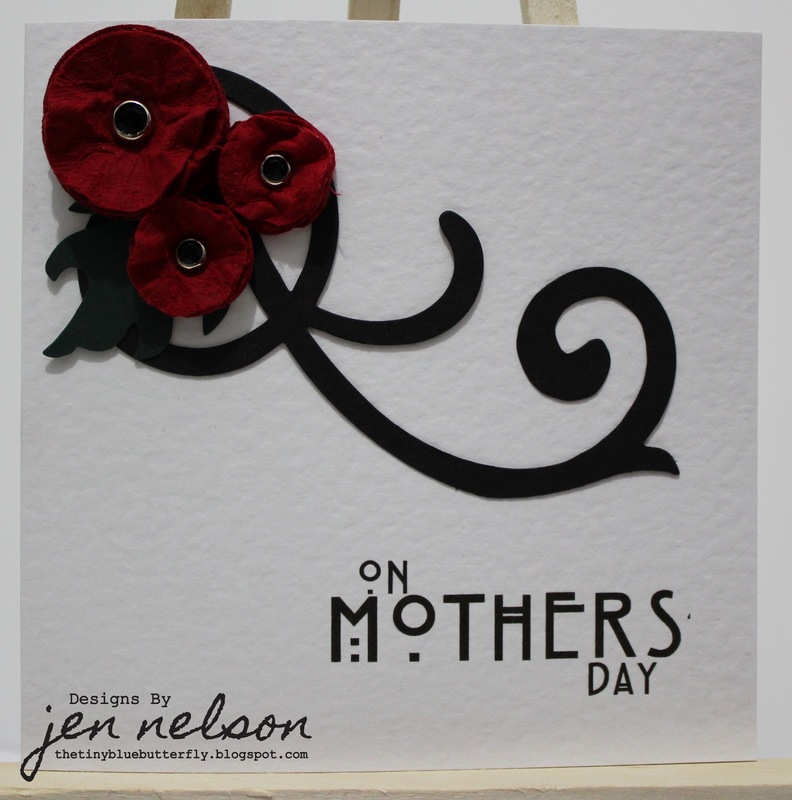 It's finished off with a little glossy accents and a simple sentiment from PC ( Font- A little Pot). So I wasn't going to post again today, but I had a spare hour so I decided to follow the sketch from I Love Promarkers and the Doctors and Nurses theme from Cupcake Crafts. 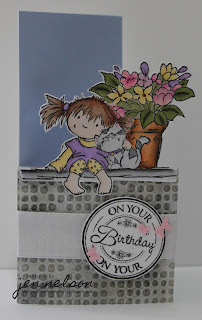 I've also not used any patterned paper in line with this weeks Totally Gorjuss Challenge. 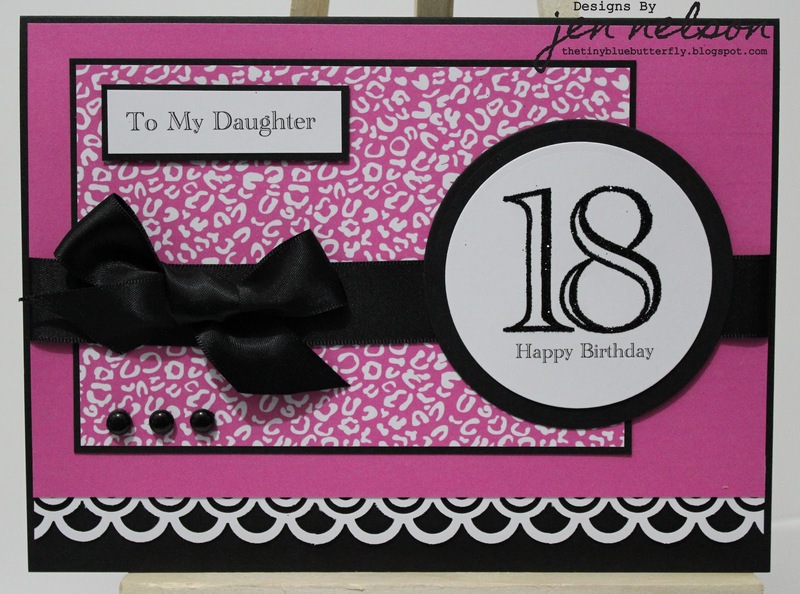 I've Printed off a Kraft sheet from Pink Petticoat ( My card blanks were too heavy) to use as an insert so it can be written, this has been attached inside with a little glossy accents. I've coloured in with promarkers (Blossom, Buttercup,meadow) the Pink Petticoat image and then cut this out. It's finished off with a clear dew drop from Ribbon Girl. This has then been added to the front of the acetate along with the sentiment. It's finished off with some seam binding and thread and a button. This weeks One Stop Craft Challenge theme is "Altered" so I've used a little box from a well known Swedish retailer and made it look a little more "pretty"..... 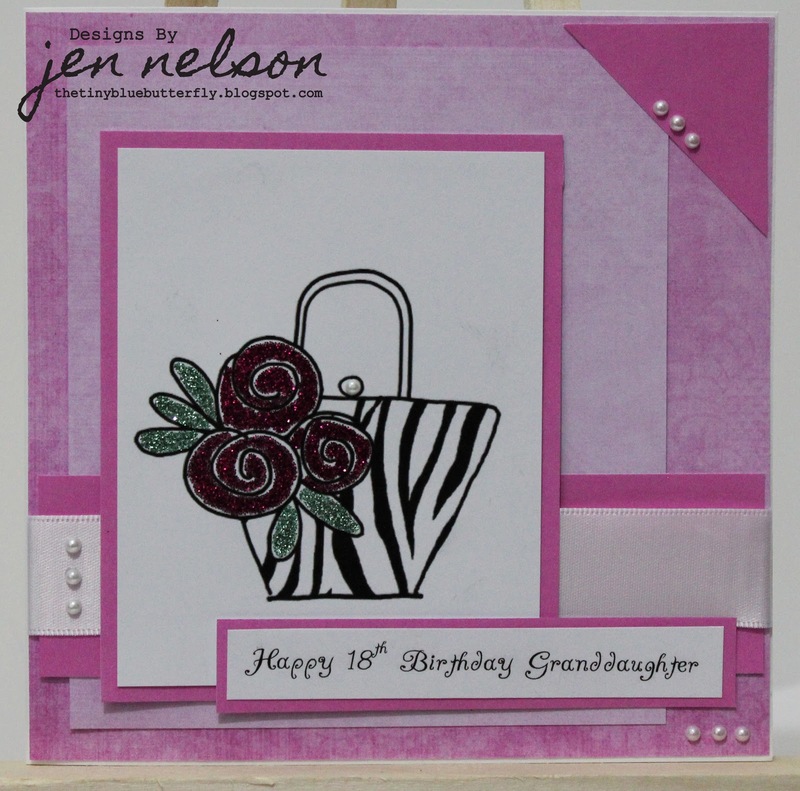 Here is this weeks creation. Hope you enjoy this weeks challenge, I'm looking forward to seeing your creations. 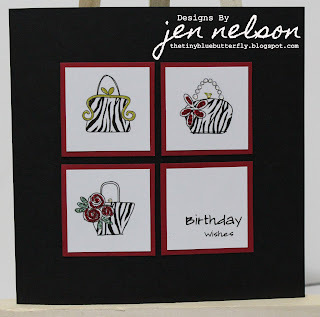 Image is Penny Black from a T for Transparent set ( sorry can't remember the name). I've coloured this in with Promarkers ( Blossom, Pink Carnation, Meadow Green, Satin, Tan, Burnt Sienna, Henna, Cocoa) and instead of blending on the prickles I've just dotted the browns over the satin. Pink flower paper is from the free gift from May's Paper craft Inspirations ( it happened to be still sat on my desk). Yellow paper is from scrap box. 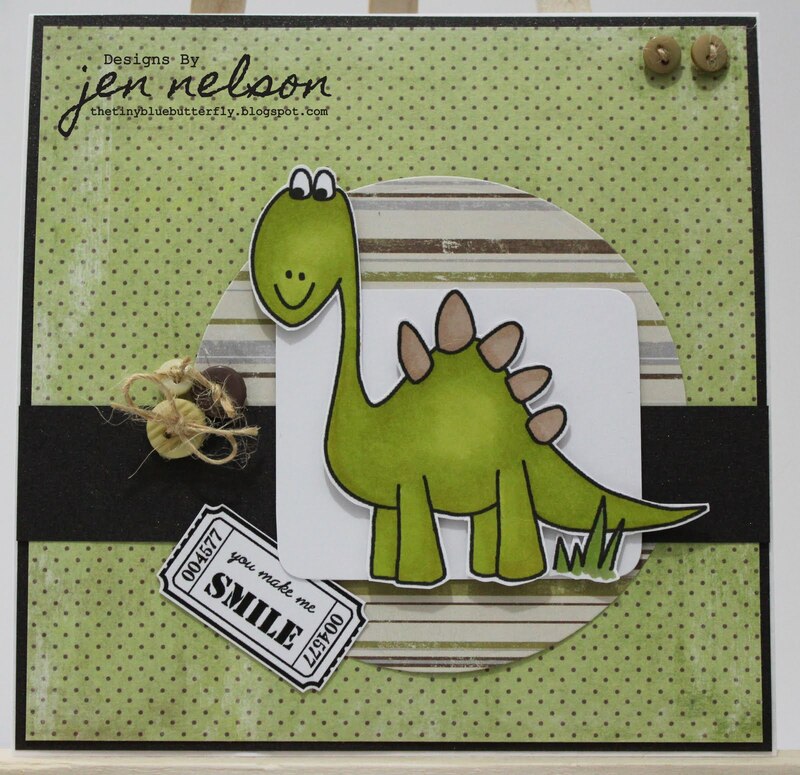 I cut out the image withe nestie and then gave it a ribbon border. 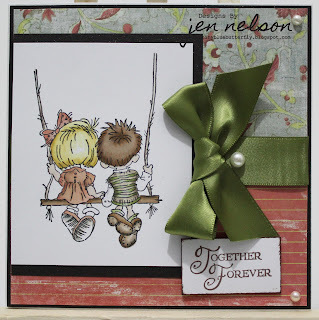 It's finished off with a few dew drops from the ribbon girl and a simple sentiment from the wood ware tiny sentiments stamps. 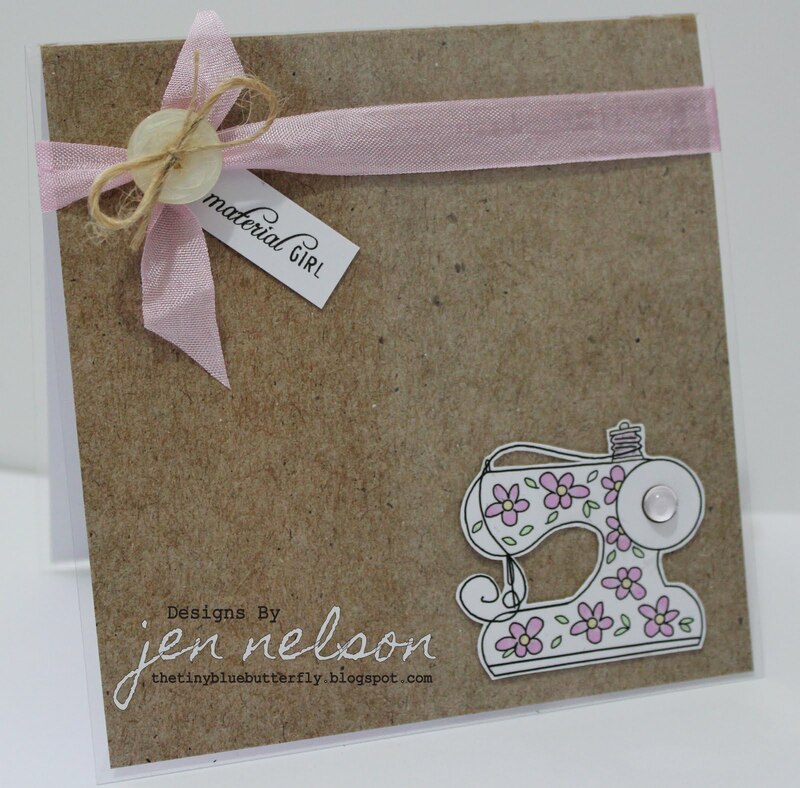 The card blank is only a 5x5 from craft work cards. Image and sentiment are from LOTV and I've coloured in with promarkers and my FC pencils ( promarkers - blossom, pink carnation, fuchsia, Ice Grey 1,3,5, apple, meadow, buttercup, tan, almond, blender). I've added some fairie kisses diamond sparkles to the dress. Flowers are from Wild Orchid crafts, leaf punch is from wood ware and the pearls are from hobby house. I've coloured in the image with promarkers (Coral, Peach, Sun kissed Pink, Olive Green, Marsh, Buttercup, Mustard, Satin, Tan, Cinnamon, Cocoa and Almond) and used my oil pencils to shade. 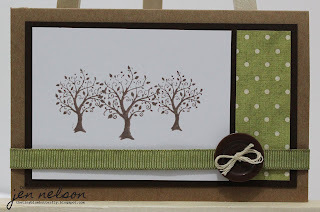 Papers are MME and ribbon from stash. Divas By Design New Challenge and DT Call!!! 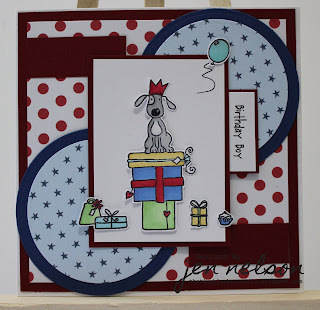 There is a new challenge getting ready to start by Divas By Design and they are running a DT call and have some blog candy on offer.... And it all starts 4th May and I can't wait!! 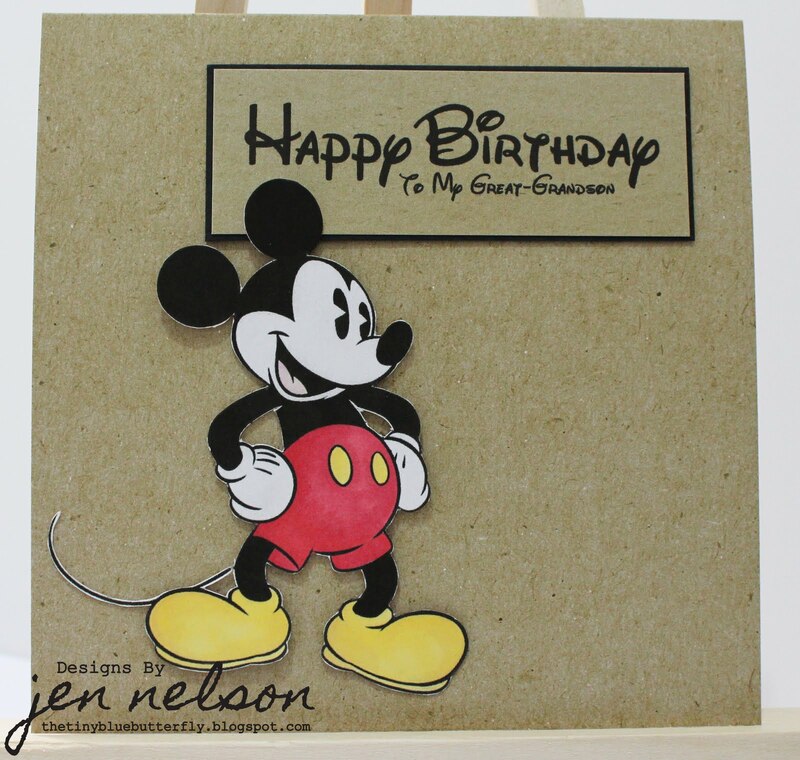 What an exciting day, I got a message earlier to email Faye at Cupcake Crafts and she asked if I would be Guest DT for May... How cool....I'm so excited!! Image is Turtley Yours (yes I know, but I think it looks more like a tortoise being that I've seen a fair few Turtle up close and personal) from the Retiring section at Pink Petticoat, I picked it out last week when I went looking for leopard print paper. I've coloured this in with promarkers ( Pear, Marsh, Lime, Aegean, French Navy, Cool Grey 4,5, Cardinal Red). 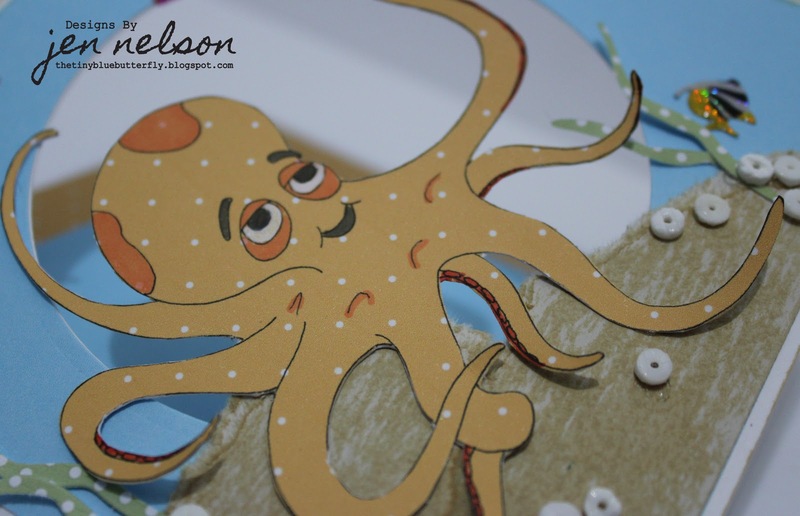 I've then cut out with a Hex Nestie and added some Glossy Accents to to spots. The Papers are all Pink Petticoat ( Big Fella Collection). 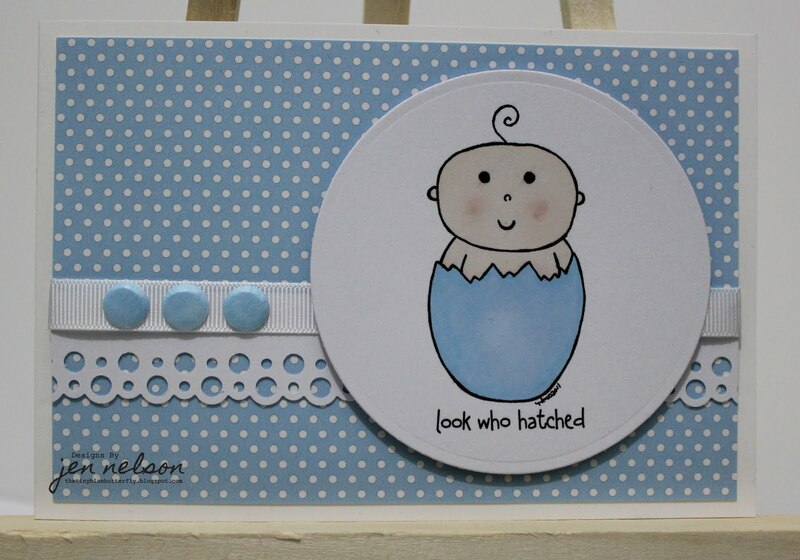 It's finished off with a sentiment printed on PC ( Font: A Little Pot) and a tad of card candy. 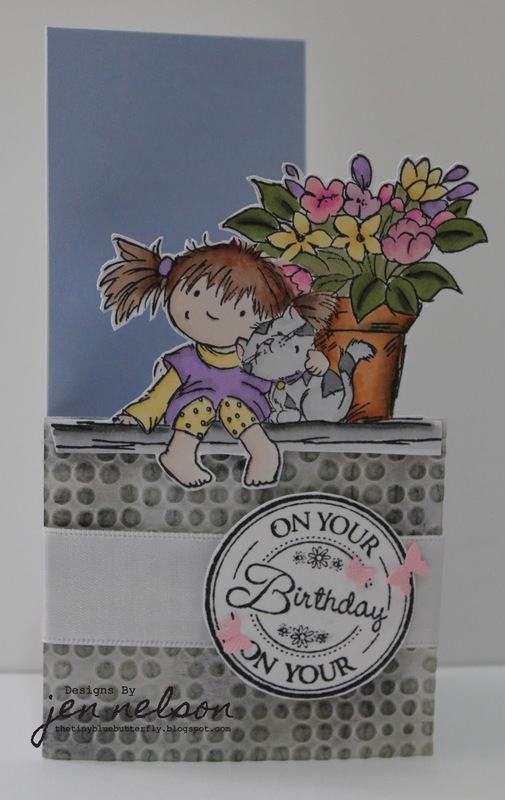 I've also entered it into " My partner in Crafting Crime Challenge #24- Layers it Up"
Image and papers are from Pink Petticoat. On the image I used photoshop to remove it from the sheet so I could enlarge it. The papers are washed damask in Little Fleur and Orchid. The pearls are from hobby house and the glitter and ribbon from my stash. I've finished it off with a PC printed sentiment. The paper is Pink Petticoat, Ribbon from stash and I've use Martha Stewart punch for the edging and finished off with a little black glitter and some black dewdrops from the Ribbon Girl. The image is Penny Blacks Cat on the Moon which I have coloured in with watercolours. I've glittered the moon and stars with clear glitter and then cut out with nesties. The pale pink paper is from scrap box and the spotty glittered paper is from First edition Love stack. The rick rack is from East of India. The glitter buttons are from American crafts and the gems from Hobby house. The sentiment is from a Penny Black T for transparent set. 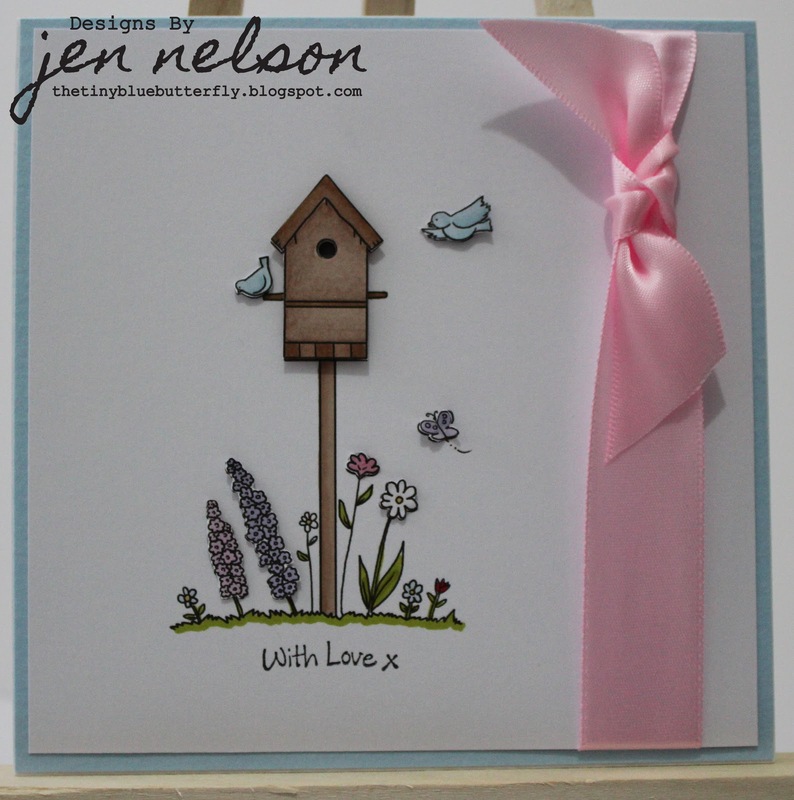 I've kept this one very simple using one of the Digi images from Little Claire's, Birdhouse. 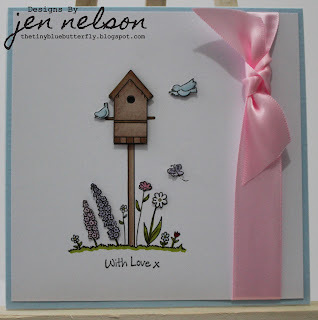 I Printed off twice and then used a decoupage effect for the birdhouse, birds and flowers to give it some dimension. 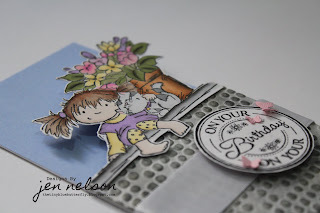 The image is coloured in with promarkers (tan, cinnamon, cocoa, blossom, pink carnation, poppy, lavender, lilac, pear, moss, buttercup, mustard, pastel blue, denim) and finished off with some pink 23mm ribbon and a simple sentiment from a fizzy moon set. 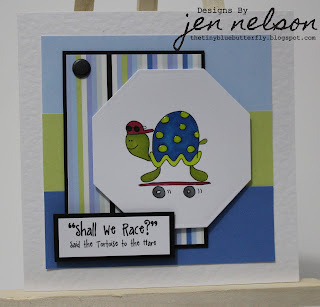 The image is Dude time doodles and I've printed this onto Tangerine fairy dot paper from Pink Petticoat. I've then cut this out and place over a circular aperture decorated as the sea. 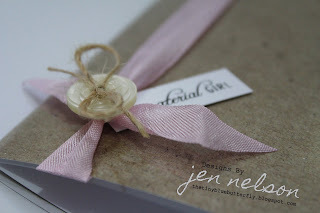 The image is a gorgeous LOTV stamp called Gift Wrapped. 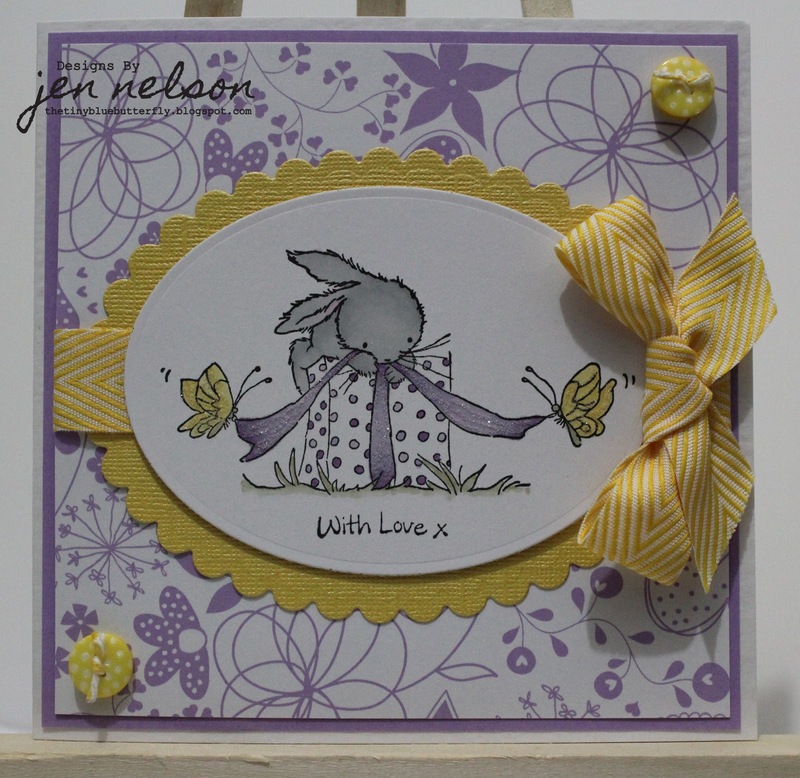 This is coloured in with promarkers (Ice grey 1-3, buttercup, mustard, lavender, lilac, amethyst, khaki, blossom ,blender). 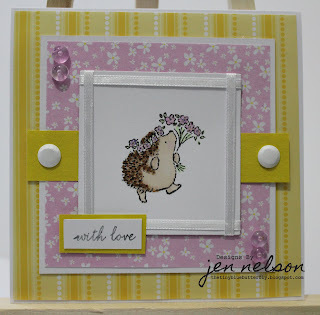 It's mounted on yellow bazzil bling card stock and then onto Pink Petticoats Pretty Doodles paper in lavender. The ribbon and buttons are from the Yellow mix bag from the ribbon girls and the bit of glitter on the ribbon and butterflies is clear from glitter magic. Hope you like it.... Ill be back bright and early for Less is More in the morning. Well I have a really good week with Top cards with my 3rd of the week (not really sure how) coming from one of my favourite cards "Leap frog over the dots". I was a little surprised to say the least. The image is LOTVs Zooming Along, which I have coloured in with promarkers (Poppy, Cardinal, Berry, Black, Ice Grey 1,3,4,5, Cocoa, Tan, Cinnamon, Pear, Moss, Pastel Blue, Buttercup, Blender). I have then cut out the image and added a little glitter to the "Angel". 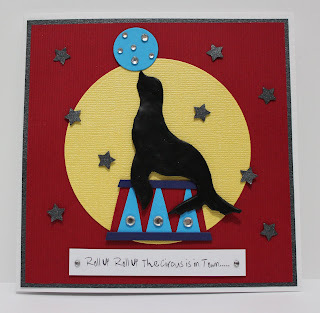 This is then positioned on a road made of black card embossed with Sizzix embossing folder - Tim Holtz Gridlock. I've used some of the white ribbon that come from the lovely packaging from the Ribbon Girl to make the road markings and then mounted the lot onto MME Bloom & Grow paper. 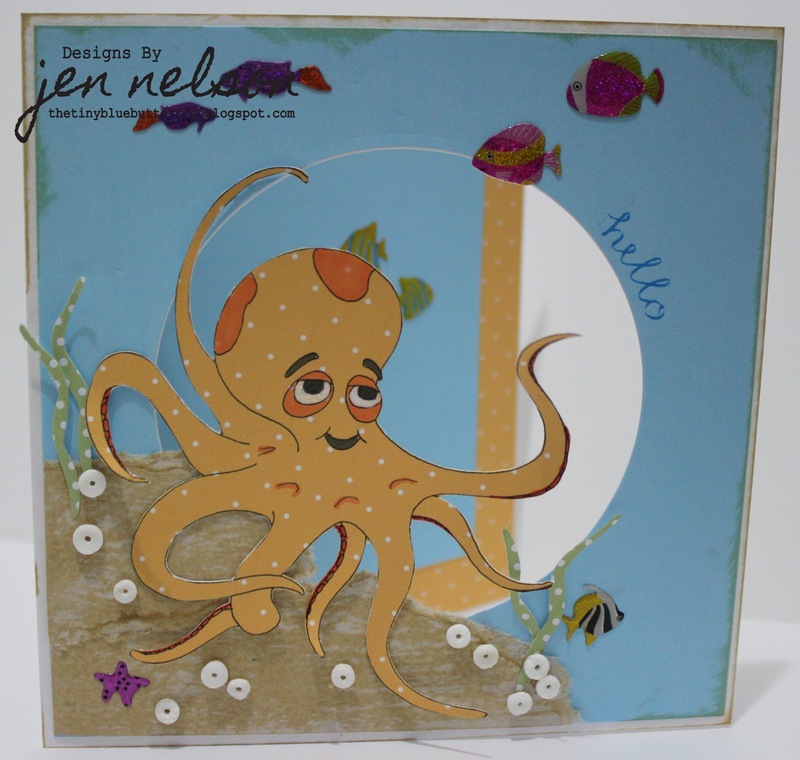 The Red crimped paper was from the papermill shop and the image is printed from PC and cut out using my nesties. It's finished off with some black card candy.